MIAMI (AP) — Josh Richardson took the last pass from Dwyane Wade, then wound up taking a wide-open 3-pointer that would have been a game-winner. Like everything else this season for Miami, the last shot didn’t go according to plan. 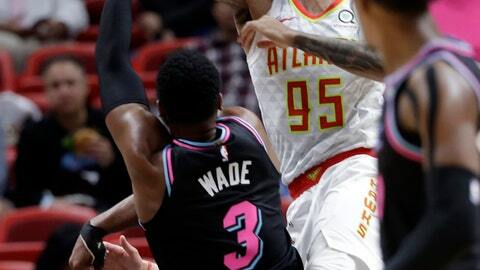 Richardson’s shot bounced off the front of the rim with less than 2 seconds remaining, time ran out on the Heat and the Atlanta Hawks — who wasted every bit of a 19-point, second-half lead — escaped from Miami with a 115-113 win on Tuesday night. Richardson led Miami with 22 points. Wade scored 18 and Wayne Ellington added 15 for the Heat, who have lost six straight at home. It’s only the 10th time in the 31 years of Heat basketball that Miami has lost so many consecutive games at home. Atlanta led by 19 early in the second half and was still up by 13 with 8:50 left, before Miami went on a 14-0 run to grab the lead — a spurt where Richardson scored seven of those points, including a follow shot with 5:04 left to cap the flurry. Atlanta answered with a 7-0 run, and Miami then scored five straight to get back within one. Prince made the second of two free throws with 14 seconds left, giving Atlanta a 115-113 lead. Miami took its final timeout, set up a play with no fewer than four options — Atlanta took away the first three — and Wade passed up what would have been a contested jumper to send the ball to Richardson for the wide-open look. “I think it ended the right way,” Young said. That quarter was far more damning than Richardson’s miss at the end. “We had one of those lulls … and it cost us the game,” Richardson said. Hawks: Vince Carter, who went through shootaround in the morning and warmed up pregame — with a 360-degree dunk as part of that warmup — didn’t play. He’s been held out of the last two Hawks games. … Young connected on a 33-footer in the third quarter, which has sort of become his thing. He’s got 10 makes from 30 feet or deeper already this season. Heat: For the first time in team history, Miami allowed 100 points through three quarters in back-to-back games. The Heat trailed Toronto 101-89 after three on Sunday, and were down 100-86 going into the fourth against the Hawks. … Whiteside was 1 for 7 from the foul line, and the Heat had 20 turnovers turned into 26 Atlanta points. Tuesday was the 11th anniversary of a dark day in Miami sports history, the slaying of University of Miami and Washington Redskins star Sean Taylor. Wade paid tribute to Taylor on his game sneakers, scrawling “RIP Sean Taylor” on them.